Fixed 8° angle helps relieve muscle strain. Adjusts to nine height positions with height range of 5 1/2” to 15”. 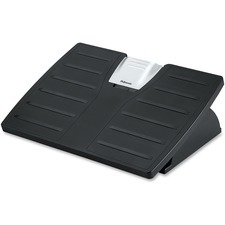 Removable platform with textured anti-slip cover. Triangular steel base with black powder coated finish. Width: 20"; Height: 5 1/2" to 15"; Depth: 12"; Color(s): Black.